MANILA, PHILIPPINES: Looking into buying a new smartphone? Look no further as Lenovo gives customers exciting deals and discounts that offer a lot more for less. For the month of March, customers can enjoy red-hot summer deals with every purchase of the Lenovo VIBE X2, Lenovo S850, A328, and A536. 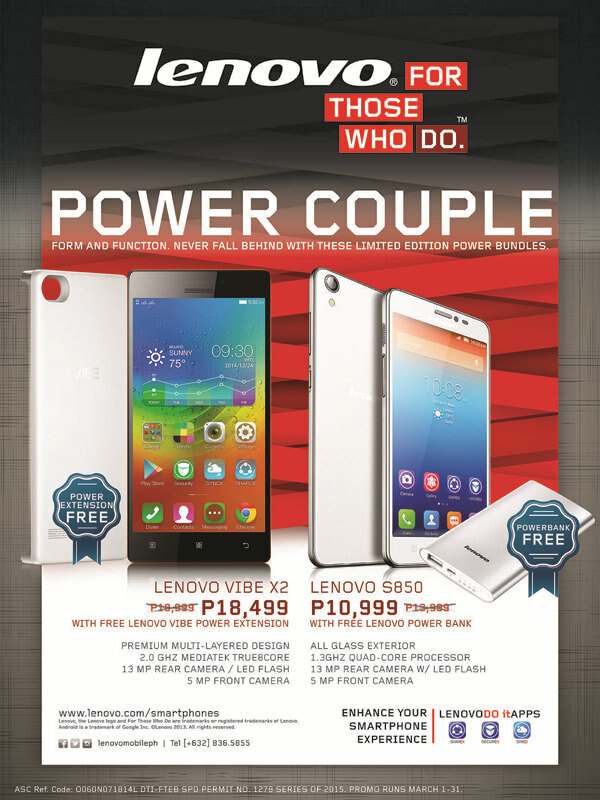 Stay connected for longer with the Lenovo Power Bundle Promo, where customers can get a free battery extension or powerbank with every purchase of the Lenovo VIBE X2 and Lenovo S850, respectively. Every purchase of the VIBE X2, now priced at P18,499 SRP (from P18,999), comes with a free VIBE X2 battery extension to allow users to do more and go further. The free VIBE X2 battery extension is worth P1,999 per unit, and will be bundled with the smartphone for a limited period only. A popular choice for stylish and fashion-forward smartphone users, the Lenovo S850 is the perfect combination of form and function. Encased in a sleek and ultra-light all-glass exterior, this smartphone ups the ante with a smooth and responsive interface, a quadcore processor, a 13MP rear and 5MP front cameras, Dual SIM capability, and a vivid 5-inch display. Powerful, stylish, affordable, and reliable, the Lenovo S850 is priced at P10,999 SRP and comes with a Lenovo 5000mAh Power Bank (until supplies last). The Power Bundle promo runs from March 1 to March 31 only. With the Lenovo Mobile Price Off Promo, you get a whole new level of big discounts on affordable smartphones that pack a wallop of features. The Lenovo A328, a very affordable smartphone offers more value for money with the Mobile Price Off Promo. With an interesting array of features, including a 4.5-inch screen, 1GB RAM, a powerful 2000mAh battery, Dual SIM capability, and a 5MP autofocus rear camera with flash, consumers can experience more for the low, low price of P4,599 SRP. Another great smartphone option is the Lenovo A369i entry-level smartphone. It is packed with impressive features such as a 4-inch capacitive touch screen, 1.3GHz dual-core processor and 2MP rear camera. This Jelly Bean-operated mobile device offers up to 4GB of internal storage, and comes in black. For a limited time period, consumers can avail of the A369i at only Php2, 799, less Php200 its original SRP when they purchase the Lenovo A328. This special price off promo runs until March 31 only. For more information on the latest Lenovo smartphones and tablets news, subscribe to Lenovo RSS feeds or follow Lenovo Mobile on Twitter (http://www.twitter.com/LenovoMobilePH) and Facebook (www.facebook.com/lenovomobileph).